Looks ordinary, but take a second look. I originally thought I didn’t have space for a pantry like this, but I had an epiphany this morning and realized I can use my laundry room as a dual-functioning pantry! An exemplary good pantry that contains all the right perks – you don’t need a map to find anything inside. From top to bottom – all boxes and containers are aligned! 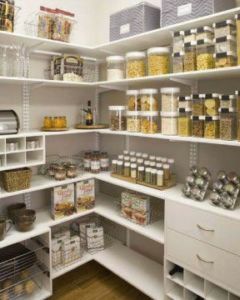 You can be as creative as possible to arrange all the jars, boxes and containers in such way that they are in the right place, easy to access and look nice.